Showing courage under fire takes both mental and physical strength. Show the firefighters in your life that their service will never be forgotten with our Firefighter 2-Coin Velvet Box, featuring a firefighter commemorative coin and a liberated Iraqi coin. Your gift comes complete with our Products for Good story and certificate of authenticity. Honor the firefighters in your life with our 4-coin Firefighter Shadowbox. Your gift includes the firefighter’s creed, a tribute to the fallen military heroes, two firefighter coins and two liberated Iraqi coins, housed in a beautiful 9" x 20" glass-encased wooden frame. 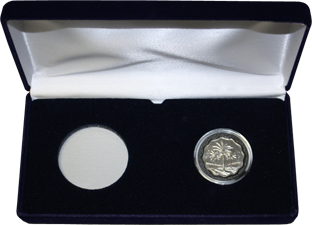 Honor the firefighters in your life with our customized Firefighter 3-Coin Velvet Box, featuring a firefighter coin, a liberated Iraqi coin and a commemorative coin of your choosing. Your gift comes complete with our Products for Good story and certificate of authenticity.